When “stars die”, they reach the headlines. But the media might have a different aim other than paying their last respects in kind through media coverage: to have news content worthy of a large audience share. This often results to sensational ratings-driven news. Yes, the public figures called celebrities deserve the public eye, but up to what extent? “Any newsman worth his salt knows immediately the big stories of the day. It’s what people are talking about, what interests the viewers, what they need to know and what they would like to know,” said Manalastas. The question rests on who determines public interest. And when does the aggrieved put a line between intruding and fair coverage? For Luz Rimban, who now teaches journalism at the Ateneo de Manila University, no ethical issues confront covering celebrities because they fall under the public figure doctrine more often applied to politicians than artists. “When their deaths are very sudden, untimely, shocking …they become even more legitimate news subjects,” she added. One news report on their Dec. 8, 2008 episode showed Mrs. Cadaweng being interviewed while in grief. They blurred Marky’s face inside the casket as she requested. The reports also delved on the grief of the celebrities who visited, most of whom were Marky’s co-stars in his television shows. They also showed the crowd outside the Cielo home in Baguio pushing and shoving each other just for a glimpse of the “stars”. However, the problem begins when the media “milk a celebrity’s death for publicity value.” In turn, the networks lose ad revenue, like in the case of Rico Yan. “When you intrude into the grief of others, that’s when it becomes bad taste… A camera doesn’t have to be present all the time. It’s bad enough that they lost loved ones, but to do it in the glare of the camera, it will be difficult for them,” Rimban said. Such may be the case when two rival showbiz programs once again mugged over an apparent disrespect of privacy. Even Cielo’s death was not spared from controversies and the enduring network war, specifically their weekend showbiz talk shows, Startalk and The Buzz. 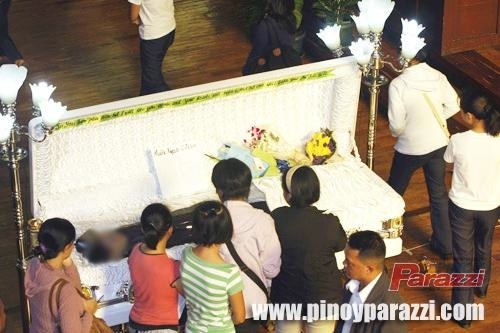 According to Philippine Entertainment Portal, the ABS-CBN crew continued to air shots of Marky in the casket, something Cadaweng wished the media not to do. This was said to have stirred the ire of the late actor’s mother in turn. “Nagtaka naman ako nang nalaman ko na lumabas sa news, nandoon yung mukha niya [Marky], kung saan, paulit-ulit akong nag-e-explain at humihingi ng paumanhin kung bakit ayaw naming pakuhanan ng picture… Bakit ginawa nila yun? Talagang masakit ang loob ko dun,”Cadaweng said in one of Startalk’s interviews. “It’s everyone’s freedom to know the latest news and it is our responsibility to get them and deliver them to the public,” The Buzz’s statement added. They said Cadaweng warmly welcomed their crew into their Benguet home and they only sought to do their duties as media persons and colleagues in the entertainment industry. They further claimed that GMA 7 started the issue that did not exist in the first place. “Probably covering the celebrity is an expression of their own losses and grief over the death of their celebrity,” Rimban said. The GMA News and Public Affairs Ethics Manual has but a vague provision in covering celebrities’ deaths in Section II, which covers fairness and fair play. The manual also lacks items on how reporters should treat news stories that involve the TV network, its executives, and its talents. Rimban also noted that the problem may also come from the different methods employed in covering and the different nature of the entertainment press from that of the news and public affairs department. Rimban added the entertainment press is not used to journalistic standards of reporting because they are run by people in show business. Although the entertainment and “hard” news media may have different objectives, a blurred line between them still exists. Rimban noted that the entertainment press, as exemplified by Startalk and The Buzz, tend to forget the journalistic standards and practice inaccuracy and sensationalism. In 1997, half a decade before Rico Yan died, not just a country, but the world, was held captive by another “untimely” death. This time it was a mix of showbiz, wealth, and royalty. The accident and funeral of Diana, the British Princess of Wales, showed an unrelenting drive in the media to keep the events surrounding her death and after constantly in the public eye. Despite the sentimentality and outpouring of emotion that followed Diana’s death, the media was quickly criticized for actually causing it. The public drive for news about the royals led paparazzi to pursue the Princess any time. On the other hand, the media attention which followed all the way to her burial was no different as well. The problem, then, is not a new one. However, changes in how the media differentiates hard news from entertainment news, as well as how they are done should be pursued. It is important to maintain high ethical standards in entertainment and public affairs news. The entertainment media can also adhere to the journalists’ code of ethics, even if they live by the orders of their superiors. Showbiz news items are better off in the showbiz news section, unless the subject is of utmost public interest. Needless to say, sensationalism should not be practiced. A clear-cut ethics manual for entertainment journalists can also be created, having the same provisions as the journalist’s code of ethics, but addressing the issues involved in the entertainment industry, like covering a celebrity’s death. Entertainment news can’t be easily removed. They can, however, be given better journalistic treatment than what is shown on television now. There is a need for showbiz journalists, reporters who don’t tell stories based on hearsay and mostly for the sake of publicity, but report in the name of newsworthiness, public interest, and accuracy. On Mar. 11, 2009 Magalona’s friends carried his remains to be cremated before sunrise, and his ashes brought to Christ the King for a final mass. People flocked Loyola Memorial Park, even at roadsides and waited for the procession, eager to see the urn that carried what remained of the Master Rapper. There were no reporters stationed at key areas, no chopper shooting the footage from above, and no hours-long coverage on the music icon’s final journey. What GMA 7 aired during primetime was an almost four-minuter about the funeral of the “Man from Manila”. Flores, M. (producer). (2008, Dec. 8). 24 Oras [television recording]. GMA Network, Inc.
Flores, M. (producer). (2008, Dec. 9). 24 Oras [television recording]. GMA Network, Inc.
Flores, M. (producer). (2008, Dec. 10). 24 Oras [television recording]. GMA Network, Inc.
Garcia, Rose & Elyas Isabelo Salanga (2008). “Network War Extends to the Coverage of Marky Cielo’s wake”. Philippine Entertainment Portal. Retrieved March 17, 2009 from http://www.pep.ph/news/20233/Network-war-extends-to-coverage-of-Marky-Cielo&. GMA News and Public Affairs. (n.d.). GMA News and Public Affairs Ethics Manual.